American business folklore is awash with the adventures of successful entrepreneurs. Still, most of these stories are about Americans, neglecting important and courageous entrepreneurs from other countries. Made in Korea recounts the story of how Chung Ju Yung rose from poverty to build one of the world's largest and most successful building empires - Hyundai - through a combination of creative thinking, tenacity, timing, political skills, and a business strategy that few competitors ever understood. Chung entered the shipbuilding business with no experience and went on to create the world's largest shipyard. He began making automobiles when foreign experts unanimously predicted he would fail, and he started a global construction company that has built some of today's greatest architectural wonders. He even convinced the International Olympic Committee to select South Korea over Japan as the site for the highly successful 1988 Olympics. Unlike most CEO's of major firms, Chung has always preferred the company of his workers to that of the global executive elite. Hard work, creativity and a capacity to never give up - this is the essence of Chung's life. In each of his ventures, he exhibited a sheer determination to succeed, regardless of the obstacles, and he worked tirelessly to instil this drive in all of his employees. Even today, in the midst of Korea's worst economic crisis in over four decades, Chung's company is busy implementing plans to emerge as an even stronger contender in the world economy. Illustrated with 32 pages of colour photographs not previously seen in the West, including photos of Chung's recent historic visit to North Korea in 1998, Made in Korea takes stock of Chung's entire life, highlighting both his contributions to society and the lessons his work can teach to aspiring entrepreneurs. "As a leading scholar of Korean business and culture, Professor Steers had presented us with critical insights and lessons concerning entrepreneurial spirit in a global context. 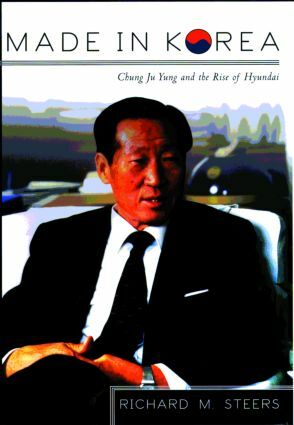 Through a detailed analysis of Korean business practices embedded in two millennia of history and culture, we learn how Hyundai founder Chung Ju Yung arose from peasant surroundings to heading Korea's premier Chaebol. This book should be on the shelf of every serious reader of entrepreneurship, leadership, and Asian business practices." -- P. Christopher Earley, Randall T. Tobias Professor of Global Leadership, Kelley School of Business, Indiana University. Richard M. Steers is Professor of Management in the Lundquist College of Business at the University of Oregon. He is the author of Korean Enterprise: The Quest for Globalization (1997) and Chaebol: Korea's New Industrial Might (1989).